THE ENGAGEMENT AT SAILOR’S CREEK. I have been receiving THE NATIONAL TRIBUNE for two months, and I cannot see how I could get along without it. I take two other papers published in the interest of the soldier, and am satisfied that THE NATIONAL TRIBUNE is the BEST published. I think that “W. 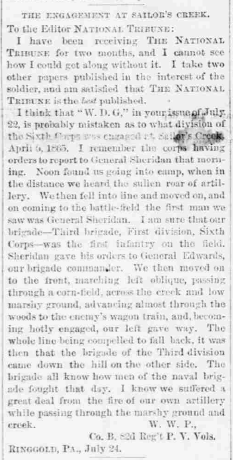 D. G,” in your issue of July 22, is probably mistaken as to what division of the Sixth Corps was engaged at Sailor’s Creek, April 6, 1865. I remember the corps having orders to report to General Sheridan that morning. Noon found us going into camp, when in the distance we heard the sullen roar of artillery. We then fell into line and moved on, and on coming to the battle-field the first man we saw was General Sheridan. I am sure that our brigade—Third brigade, First division, Sixth Corps—was the first infantry on the field. Sheridan gave his orders to General Edwards, our brigade commander. We then moved on to the front, marching left oblique, passing through a corn-field, across the creek and low marshy ground, advancing almost through the woods to the enemy’s wagon train, and, becoming hotly engaged, our left gave way. The whole line being compelled to fall back, it was then that the brigade of the Third division came down the hill on the other side. The brigade all know how men of the naval brigade fought that day. I know we suffered a great deal from the fire of our own artillery while passing through the marshy ground and creek. Co., B, 82d Reg’t P. V. Vols.